Let me just start by saying...these cookies are AMAZING. Mind-blowing. Stupendous. Orgasmic. And a bunch of other happy words. 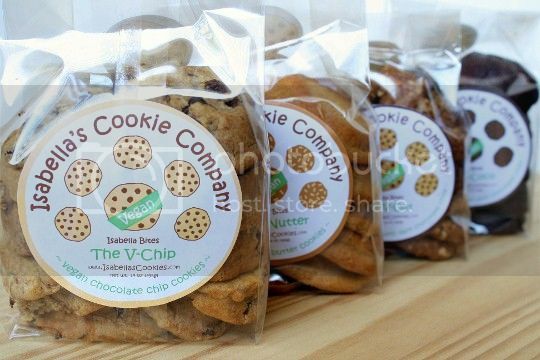 Of the four vegan varieties, four are your classic cookie flavors...and then there's another one which I'll get to later. There are no artificial ingredients in these cookies, and they taste that way. Seriously, they taste like freshly baked cookies straight from granny's kitchen. How they do it, I don't know...but I want the recipes!!! While they are vegan, the cookies aren't necessarily healthy: each one is at least 11 grams of fat. But they have an interesting shape, almost double-decker like, so it's really like eating two cookies in one! In fact, I tried to be good and only eat one cookie per day as a treat. Believe it or not, I was successful...but that led to another discovery. There are 10 cookies in each "big" bag, and the very last cookie (yes, 10 days later), was still soft, chewy, tender, and absolutely delicious! Isabella, how do you do it?! 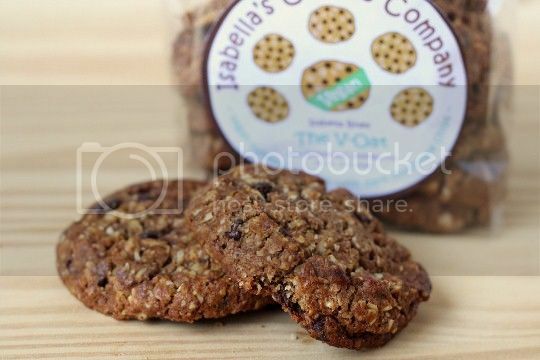 Isabella's also does custom cookie orders (check out their super cute website below), which can be ordered online. Cookies can be found in many natural food and gourmet grocery stores, at about $4 for a 5-cookie bag or $7 for a 10-cookie bag (go for the latter, you'll want as many as you can get!). Let's start out with the standard chocolate chip cookie. Isabella's is thick, cakey, and chewy. They're rich, with the perfect amount of sweetness and the perfect contrast of slightly bitter semi-sweet chocolate. Seriously, you could fool anyone into thinking these weren't vegan. For a classic, basic cookie, these are beating out probably most chocolate chip cookies I've ever tried (non-vegan included!). 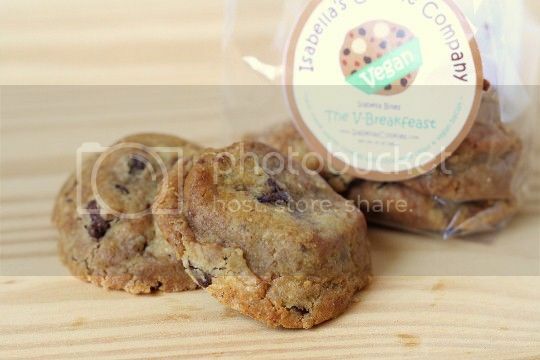 So I've got two favorites of Isabella's vegan flavors: this is one of them. I really, really, really only wanted to have one #1, but it's hard to limit them for a different reason (you'll see below). This is like a mix between devil's food cake and a brownie, all mixed into a thick and cakey cookie. Just look at that dark fudginess! They're super decadent, rich and extra dark chocolatey (and I'm not even a big fan of dark chocolate!). They aren't overly sweet, and there's an almost bittersweet chocolate flavor to them. This is a true chocoholic's dream; I definitely wouldn't consider myself a chocoholic, but these are my favorite, so that must say something. 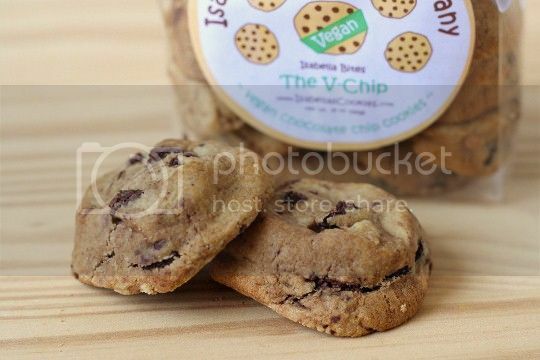 Another cookie that no one would even think twice about being vegan. Of the four "classic" flavors, I think this is by far the best. 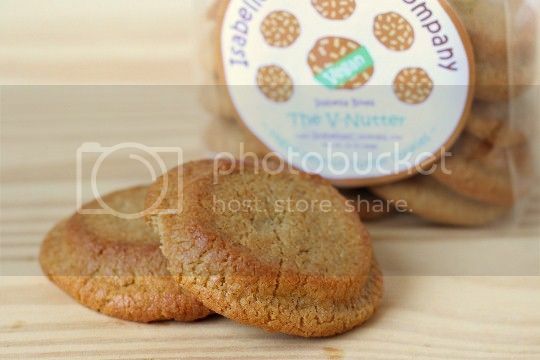 This is a different kind of peanut butter cookie. Thick and cakey texture, yet not overly decadent and probably one of the "lighter" tasting flavors. The sweetness amount is perfect, but what I found interesting was the slight fruity taste, like there was banana or apple in them. However, there's no fruit to be found anywhere in the ingredients...again, Isabella's how do you do it?! This one is a definite winner when you want a mouthful of sweet peanut buttery goodness. So I'm not a huge fan of oatmeal cookies; I usually find them quite boring (with the exception of Mother's Iced Oatmeal from my childhood days). Isabella's version has the same thick, cakey texture of the other cookies, yet they were slightly crumbly (albeit, still soft and chewy). What I did like about these was the fact that they weren't oatmeal-raisin, but oatmeal-chocolate chunk! They're also heavily laced with cinnamon, so there's a wonderful combination of warm, homey flavors going on. If you're on oatmeal cookie fan, you need to eat these. And finally, we come to the genius creation of all vegan cookies (you know I had to save the best for last). I previously mentioned that the V-Coco was my favorite of the bunch, but that's among the "classic" flavors. The V-Breakfast wins the Oscar for Best Creative Compilation category. I mean seriously, who came up with this?! As soon as I opened the bag, I was immediately greeted with the smell of pancakes and syrup. The cookies are maple-flavored and packed with chocolate chunks, chewy waffle pieces, and salty bacon bits (faux, of course). Can you imagine what this must taste like? I'm not even sure I can describe the sheer delight of eating one (or two, or three...). I'll just say this: if you're an Isabella's virgin, the V-Breakfast should definitely be your first! 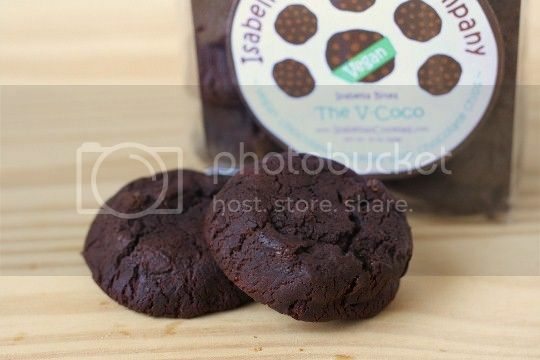 I'm so glad to have found Isabella's Cookies (and it's even cooler that they're near me!). I'm still craving my daily V-Coco! Or is it my daily V-Breakfast... Or daily V-Chip...? I want all of the cookies!!! What a great review. I always saw them while shopping at whole foods but never tried them because I am usually disappointed by vegan cookies. I will be sure to get a pack next time I go. Now... to pick a flavor! I must be having a cookie craving, because these look really, really delicious (and your pictures are great, too!). I haven't seen them locally, though, so I'll probably have to check out their website. I live in Canada and we don't have Whole foods or some big chain healthy food store. We miss out on this stuff :(. No anywhere to get them online.